As a visual discussion between art and science, MacCallum uses her husband’s science papers to make casts of the exterior of his body. She dresses the casts in female garments and displays them in a darkened space with theatrical lighting, projects imagery of space explorations and plays voice recordings of him reading his scientific papers. At SymbioticA MacCallum dealt with the interior of his body. Images were made of his blood cells in the Image Acquisition and Analysis Facility in the School of Anatomy and Human Biology and sound recordings were made of his blood circulating in his veins. These were used as part of an installation called, “Physics Dissected” in which a cast of MacCallum’s husband’s naked body was suspended in space. The back of the cast wore a long, skirt-like train sewn from his papers. The DVD of his blood was projected onto the train, making a textile-like pattern; the sound of his blood emanated from a speaker hidden in the front cavity of the body where the chest and stomach area had been cut away. 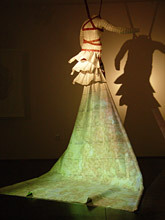 A theatrical pin spotlight was projected onto the shoulders of the cast making a dramatic wall shadow which was large and threatening, yet female in appearance.